Selim Miah went to the Meghna river to catch fish with his father when he was nine years old. Now, 41 years later, he is still fighting to make ends meet. “We are struggling to find food to survive; not just for a few days or nights, we struggle day after day. Being a fisherman is a curse!” Selim Miah told thethirdpole.net. 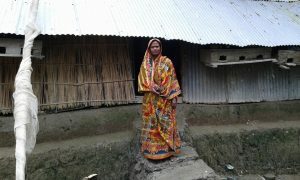 Like Selim Miah, more than 200,000 fishermen who live in the island district of Bhola experience the same fate. Hilsa is sold for BDT 1,150 (USD 15) in the super stores of Bangladesh’s capital city, Dhaka. But Selim Miah and his fellow fisherman in Bhola or Chandpur struggle on a monthly income of about BDT 3,000 – BDT 5,000 (USD 40–50) to meet their family expenditures. Hilsa is one of the most important fishes in the Bay of Bengal, which has traditional importance in the Bengali culture apart from being economically and nutritionally significant. More than half a million coastal fishermen directly depend on it for their livelihood and nearly three million people in Bangladesh are involved in trading, processing, transportation and marketing of Hilsa fish. But, according to World Fish, the fish stock is under threat mostly due to rapid siltation in the riverbeds and over-exploitation of brood and juvenile Hilsa, locally known as jatka. Hilsa production was around 220,000 metric tonnes in the 2001-02 fiscal year and it increased to 387,000 metric tonnes in 2013-14, a 75% increase, Syed Arif Azad, the Director General of the Department of Fisheries, told thethirdpole.net. This rise in production has not changed the desperate straits in which Bangladeshi fishermen find themselves. Forced into a choice between penury and illegality, they choose to break the law, trying to earn a little more by catching the juvenile Hilsa. “We know very well that catching Jatka is illegal but many of us violate the ban,” said Selim Miah. “We go fishing during the period it is banned, as there is a job drought, and the mahajans (local money lenders) force us to pay back loan installments,” he added. Most of the poor fishermen work on boats owned by the mahajans. The owners have full control over the fishermen as they lend money to them for buying nets and other fishing equipment. “Fishermen are always exploited by the mahajans. The prices that we receive for our catch do not adequately reflect the prices paid for Hilsa in the wholesale or retail markets where they are subsequently sold,” Abdul Sattar, another fisherman of Tulatoli village in Bhola, told thethirdpole.net. With a few exceptions, fishermen never directly communicate with wholesalers, retailers and consumers. They sell their catch at the landing centres to suppliers, locally known as baperies, with the help of commission-based sales agents known as aratdars. Sales agents receive commissions at different rates, normally 2-5% of the auction price, for their services. And the auctioneers and suppliers play a crucial role in determining price for Hilsa at the landing centres. The fishermen are at the bottom of the heap, unable to influence the price at which they can sell their catch. Mizanur Rahman, a programme coordinator of Coast Trust, an NGO working for the improvement of the livelihood of the fishermen, said that the average household debt of the fishermen in Bhola is about BDT 62,000 (USD 792). Quoting from a recent study done by Power and Participation Research Centre (PPRC), he said that about 33% of fishermen are landless while 40% have no boat and 29% have no net to catch fish. Aiming to boost Hilsa production, the Bangladesh government is providing incentives to the affected fishermen communities under a social safety net programme. These are supposed to help them not to fish during the four month period when fishing is banned, from January to April, which is the peak breeding season for Hilsa. Fisheries and Livestock Minister Muhammed Sayedul Hoque said that about 158,000 metric tonnes of food grains were distributed to over 224,000 households of fishermen under the vulnerable feeding programme in the last six years. But on the ground the initiative has proved insufficient. Abul Kashem Majhi, the secretary of the Bhola Central Fishermen Cooperatives Society, said that currently about 200,000 fishermen are directly involved in Hilsa fishing in Bhola island but the government has registered only 117,000 fishermen. He said that more than 50% of those registered were not fishermen, and the registration was influenced by local political leaders to benefit his voters. According to him, the food assistance provided by the government in most cases does not help the poor fishermen. Each household is supposed to receive 160 kg of rice in four months. But in most cases they only receive 40 – 60 kg of rice due to corruption. Not only that, this grain only arrives after the ban period. As there is no work and no food during the four months of the fishing ban, the poor fishermen go to the river to catch jatka anyway. During the ban season, Salem Miah said the fishermen do not have any work, and thus no food to support their families, and they are forced to go to the mahajans and borrow money. “We do not want any financial assistance or food support from the government,” Abdul Sattar said. He urged the government to provide them training and funds to set up small business or include them in the other short-term income generation program to ensure a regular flow of income during the fishing ban. With a view to save Hilsa fish from over-exploitation due to effects of climate change, Bangladesh has already started work on setting up a Hilsa Conservation Trust Fund (HCTF) for better conservation of Hilsa, including the creation of alternative livelihoods to the coastal fishermen. According to the Department of Fisheries (DoF) officials, the United Kingdom’s Darwin Initiative is providing support to the DoF to set up the fund to enhance the effectiveness of Hilsa management. The International Water Association (IWA) has also started a project that aims to identify appropriate alternate livelihood options for the Hilsa fishers in Bangladesh and India. The Dhaka-based Bangladesh Centre for Advanced Studies (BCAS), the London-based International Institute for Environment and Development (IIED) and Bangladesh Agricultural University (BAU) have been working with the DoF under the Darwin Initiative to reduce threats to the Hilsa in the lower Meghna River. “Catching jatka must be stopped for the conservation of Hilsa. And for this we need to address the issues of seasonal job drought of the poor fishermen,” said Abdul Wahab, a fisheries professor at the Bangladesh Agricultural University. “Once the Hilsa Conservation Trust Fund is set up, there will be huge scope of generating alternative livelihood options to the coastal fishermen as effective conservation initiatives will be taken spending money from the fund,” he said.